If only that were true. What would it be like, I wonder, to move through life without ever having to worry about dieting? I’ll never know, but I do know one thing: when I’m hiking is the one time that I truly don’t worry about diets. Okay, so it doesn’t have the same zip as “There’s no crying in baseball,” but let’s celebrate this. How often do you justify an indulgent meal/snack by promising yourself that you’ll spend an extra hour in the gym to make up for your transgression? (Too often, I bet. Don’t worry, I’m not judging.) Well, one of the great benefits of hiking — besides getting fresh air, and taking the time to slow down and notice the world around you — is that it’s great exercise. I did some very scientific* research by looking up “hiking calories burned” on the Interwebs, and got a range of calories burned per sixty minutes of hiking, from as low as 340 calories to as high as 530. The broad range is likely because no two hikes are the same; some require constant climbing and are highly strenuous. Others are only a little more challenging than a walk in the park (and we know that a walk in the park is like…well, a walk in the park). But the exact numbers don’t really matter. Even at 340 calories, that’s a lot of calories. And remember, that’s just one hour of hiking. If you go on a day hike and are out on the trail for six hours or more, you’re probably burning well over your normal calorie intake for the day just in those six hours. Therefore, when I’m hiking, I really don’t worry too much about how many calories I’m eating. I try to pack a balanced array of food, and some extra energy bars, and I eat when I’m hungry, which tends to be at fairly regular and frequent intervals. 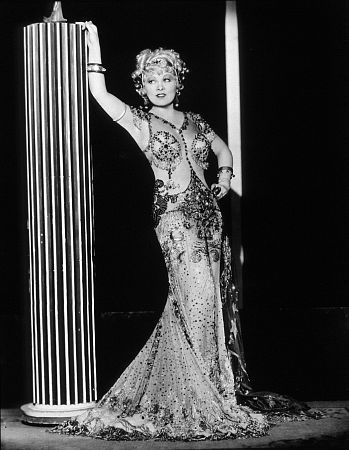 So when you’re on the trail, make like Mae West and don’t worry about dieting…but carrot sticks are a pretty good hiking snack. I’ve been out in southern California for the past week, scouting the area as a potential new residence. While much of this time has been spent visiting different parts of San Diego, Orange County, and Los Angeles, driving around, getting the feel of the place, I couldn’t leave without trying out the local hiking. The problem? I found that on my last day in the area, after nearly two weeks of traveling (I was in Austin, TX before this), I was sort of exhausted and not really up for the preparations or the doing of a long, difficult hike. What I really wanted was a walk in the woods, or something like the woods. I asked around, and four separate people told me to check out Torrey Pines State Reserve for some easy, short hikes with fabulous views. Several others told me to check out Cabrillo National Monument, and I have a thing about National Park Service Sites. So I decided to do both. Today I’ll give you the skinny on Torrey Pines, and on Thursday you’ll get a recap of the visit to Cabrillo. 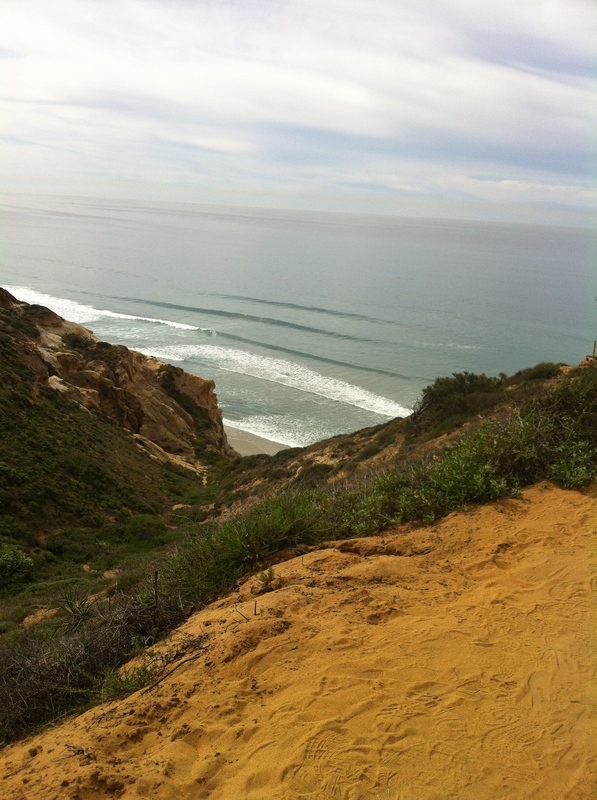 Torrey Pines is an easy 30-minute drive up the coast from San Diego, just north of La Jolla. The drive itself is pretty, especially once you get off of I-5 onto Carmel Valley Road. You enter through the North Entrance, pay your $10 all-day access fee (or find parking on the beach or on the road, if you can…I didn’t because I wanted to drive up into the park). 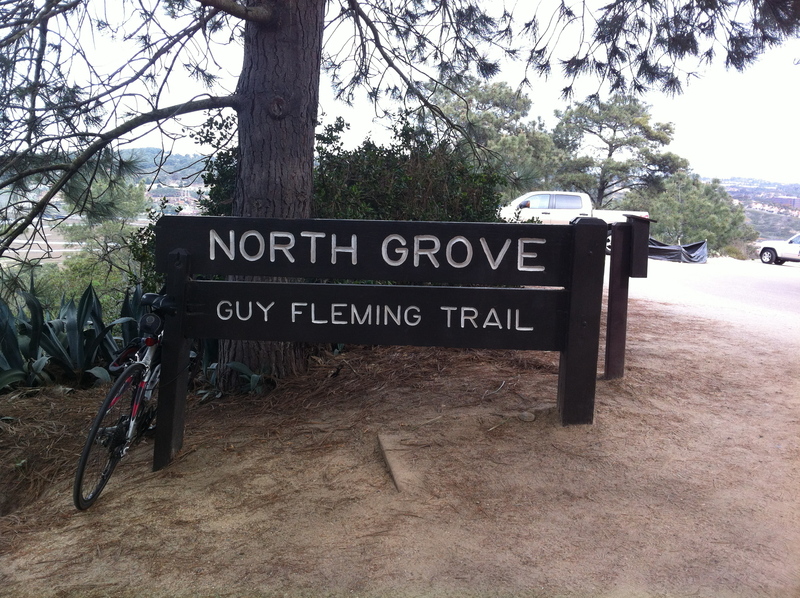 I decided on the Guy Fleming Trail, because I had another stop to make. It’s short, only ~2/3 mile, and mostly level, with only some brief climbs and descents, and a few stairways. The first thing that worked for me about this trail was the views. I was promised fabulous and I indeed got fabulous. Going clockwise around the loop, you’re immediately greeted with a sweeping ocean vista, as the trail runs along the side of a cliff that drops down to the beach below. 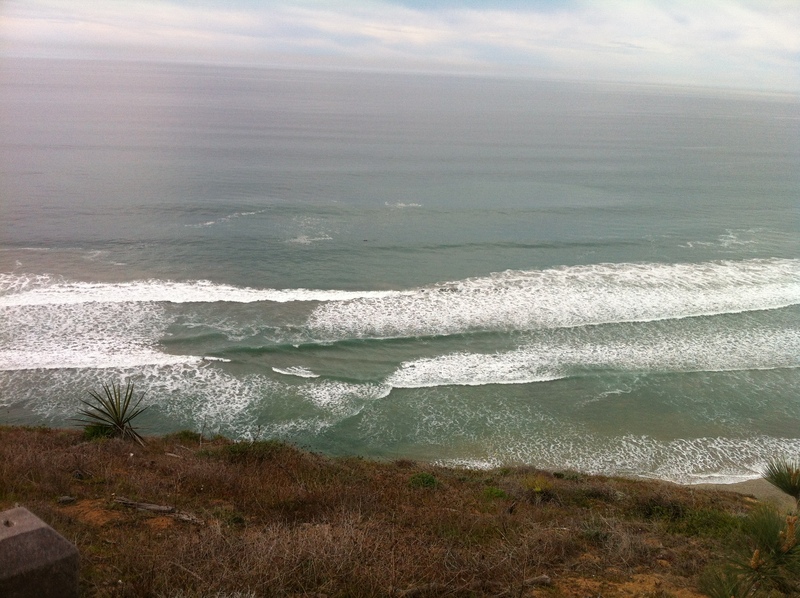 The waves at Torrey Pines are spectacular, and mesmerizing to watch. I found myself stopping every fifty steps or so to just look out at the water for a while. There are two designated “viewpoints,” but the entirety of the first half of this trail could be considered a viewpoint. As an added bonus, there was a pod of dolphins just off the coast, so I watched them playing in the waves for a while. Then, I noticed that the birds — whatever kind they were, I didn’t have my binoculars and probably wouldn’t be able to tell anyhow…gulls of some kind? — were surfing. Seriously, they were gliding on the edges of cresting waves, and it looked like they were having fun. The second half of the trail was inland, so the views were of the town of Del Mar instead of the ocean, but it was still pleasant. There were also some fun sandstone features, and I learned that the trail is named after the man who made Torrey Pines a state reserve in order to save the trees, which are a rare five-needled pine tree. In all, the hike was nice, if merely a walk. It was perfect for what I wanted, and I could have spent hours just watching the ocean, so I felt like I got my money’s worth both literally and figuratively. One word of caution: the road leading up to the trail is littered with people jogging and stay-at-home moms walking gigantic baby carriages. Because the road winds, it is hard to see the pedestrians lurking around corners, so please please obey the 15 mph speed limit, and go even slower around those hairpins. Well, hi there, Happy Her Side Hikers! Yes, I’m back. I was on a self-imposed hiatus for some time for personal reasons, but it’s a new year and time for a fresh start. First, I wanted to alert you all to some big events coming up. Tomorrow, January 7, is Winter Trails Day. What is Winter Trails Day, you ask? 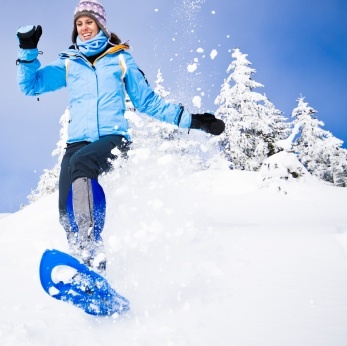 It’s a day where all over the country (where it’s winter, I guess) you can find a location to try out snowshoeing and cross-country skiing for free! Here in the Boston area, the Weston Ski Track is hosting, so get on down there and fall in love with snowshoes. If that wasn’t enough, on January 14-16, the National Park Service is hosting a FREE weekend in the National Parks in honor of Martin Luther King, Jr. day. There are lots of parks to choose from, so if you’ve never been to a National Park or if you haven’t been in a while, next weekend is the perfect weekend to change that. 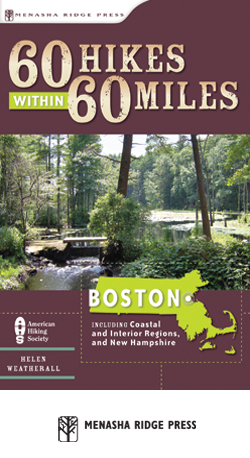 60 Hikes Within 60 Miles of Boston: I found this book, by Helen Weatherall, published by the American Hiking Society, that details hikes close to Boston. It came out in 2008, but it’s new to me. The hike descriptions are my favorite kind: chatty and interesting while still providing information necessary to figure out what you’re getting yourself into and where you’re going. The hikes in this book range from Boston’s Freedom Trail (more of a walk in the city than a hike, but since I love the Freedom Trail I’m not complaining) to 8 mile hikes in state forests. Join me as I tackle these one by one (or two at a time, in some cases) over the coming months. 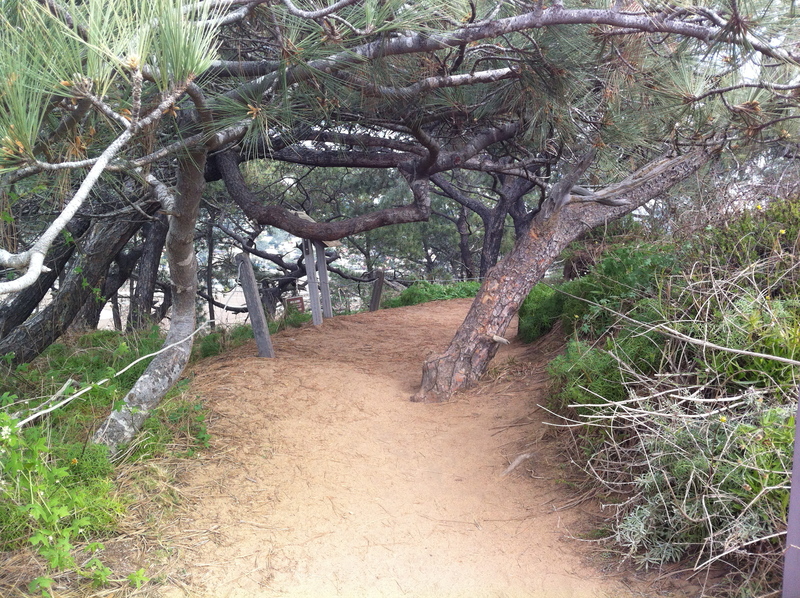 First up, I’ll venture into one of the seaside hikes next week (don’t you love the beach in the winter? ), take lots of photos, and let y’all know how it goes. Time to break out that winter hiking equipment, which we’ll also talk about. 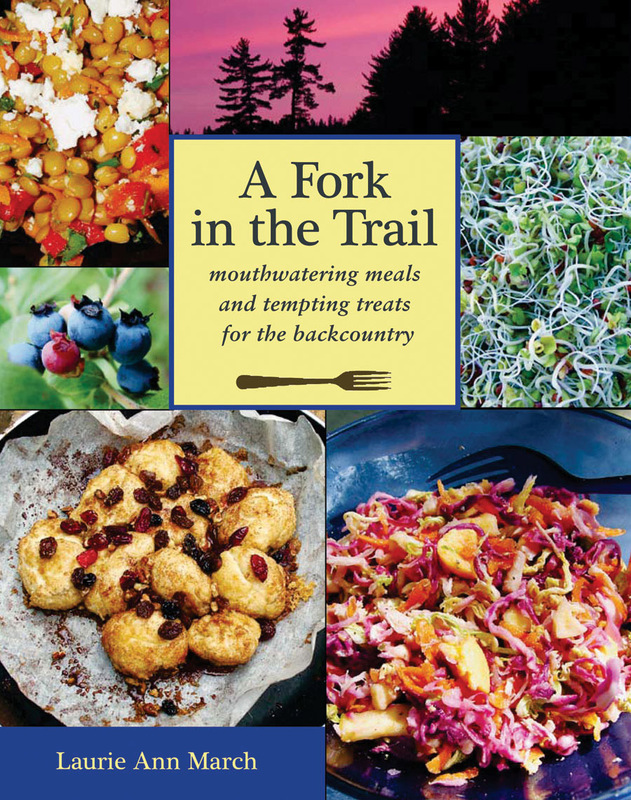 Tasty Trail Food: Last year, two people gave me this book, by Laurie Ann March, that details make-at-home treats to take with you while backpacking. Because life gets in the way, I never got around to trying it. Some of the recipes lend themselves more to camping in the backcountry rather than simply packing lunch or snacks for a day hike, but I’m going to give some of these a try and let you know what I think in terms of ease of preparation and location of ingredients, ease of packing and carrying, and tastiness. Also, since I somehow ended up with two copies, I’ll be hosting a contest a little later on this year, and you can WIN the other one! Also, in early February I’ll be taking a trip to San Diego to audition the area as a potential new place to live, and I’ll be sure to get in a good hike while I’m there. Suggestions welcome! So I’m pretty excited about all of this — are you? Imagine an amazing hiking day. There’s a light breeze, but the temperature is nearly perfect. You’re whistling a little tune as you’re hiking down the trail. You have your backpack of supplies. You’re reveling in the sights, sounds and smells of nature, dawdling here at a brook, spending time setting up the perfect shot there, laying out on the rock at the peak, closing your eyes to just be for a while. Sounds like a great day, doesn’t it? Suddenly, in the distance, you see some angry-looking dark gray clouds. They seem to be moving toward you awfully quickly. You start down the trail, hurrying now, but sure enough, it soon starts to rain. Hard. You find some semi-shelter and wait it out, but by the time it stops the sun is going down. Suddenly, what started out as a great hike, one that was simple for you, turned harrowing, all because the weather and the time caught up with you before you realized it. Something similar happened to my friends. If you remember, they left for their hike on the late side, were not familiar with the trail, took a couple of wrong turns, were hiking slow, and then it started getting dark — and scary — fast. Everything is different in bad weather and when the sun goes down, and all the slightly dangerous things about hiking get a lot more dangerous: animals moving under cover of the darkness, higher chance of injury because you can’t see where you’re going, the temperature drops, etc. Pay attention to the time and the weather. Please don’t leave for a 3 hour hike 3 hours before sunset. Please check the weather forecast for where you are hiking (i.e. not your house) before you leave. Please keep an eye on the time — yes, wear a watch or have something on you that keeps track of time — and an eye on the weather. 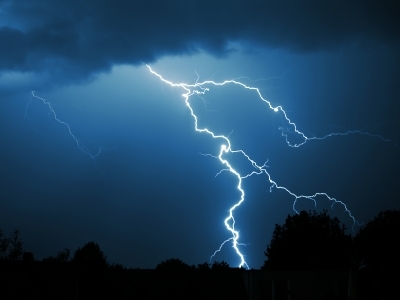 Watch for clouds, darkening skies, temperature dropping, the smell of moisture in the air. This is not to say that, on some occasions, you can’t hike with an iffy weather forecast. Just use your head. If the forecast calls for light showers in the late afternoon and you plan to be back by noon, you just have to keep watch on the weather while you’re on the trail. If, on the other hand, you’re planning to snowshoe and there’s rumors of a blizzard, today might be the day to catch up on that novel you’ve been wanting to read. But you don’t have to be, because I’m here to help you not make the mistakes that I made when I started out hiking and camping solo. On Wednesday, I posted this photo, of me at the end of my very first solo hike, on the teeny, easy little Door Trail at Badlands National Park in South Dakota. I asked you what was wrong with the picture — in other words, could you tell from this photo all the rules I was breaking and mistakes I was making? I’m wearing the wrong shoes. If you look closely, you’ll see I’m wearing Teva sandals. Why are these wrong? Let me count the ways. First of all, they don’t provide the support needed for “real” hiking. Second, they leave my feet (including fragile toes) completely unprotected. They might be cooler than boots, but jagged rocks and sticks and rocks could do a number on my poor exposed feets. Because this was a very short, easy hike, this wasn’t really a problem. Would I do it again? Not if I had never hiked the trail. If I knew the trail well, I might, but without knowing the lay of the land, that was dumb. I’m not wearing sunscreen. Now, you can’t see that from this photo, but trust me, it’s true. I didn’t get too burned. I actually think I had put on sunscreen that morning, but at this point it was early afternoon and it was time for some more. I’m wearing the wrong shirt. Yes, that is a cotton t-shirt. I like that t-shirt. But it isn’t hiking-friendly, particularly not in hot, arid, South Dakota in August, when I was sweating just standing around. This isn’t a fatal mistake. I spent years hiking in regular old t-shirts before I discovered the wonder of wicking, and now I live in my hiking clothes in the summer. 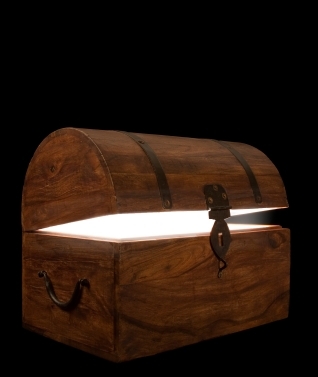 But since we’re picking out things I would do differently with the experience I have now, this goes on the list. Oh, and Josh is right: while somewhat minimal here, lighter colors and the desert are usually better companions. I’m not carrying my first aid kit. Oops. Now, I have said it isn’t strictly always necessary to carry your first aid kit, if you’re doing a really easy, short hike that you’ve done a million times and there’s a decent population there with you. I don’t bring my kit when I traipse around Walden Pond, for example. But here, in a part of the country I knew nothing about, on a hike I had never done, which could have rattlesnakes (something that wasn’t even a little bit on my radar at this point), not carrying the kit is stupid. Thankfully, this was such a short hike, and there were a fair number of people there, so I wasn’t really in any danger from this mistake. The next hike I did, immediately thereafter, however, I was the only one on the trail, and it involved climbing. Not having the kit there was especially especially stupid. As Dad and Deborah noted, I also don’t have a pack. This means my water is limited to my Nalgene bottle, and I don’t have any of the other essentials with me (cell phone, whistle, compass, etc.). For this hike, again, it was short, easy and well populated, so it wasn’t a problem. But for the next hike, what was I thinking? I’ll tell you what I was thinking. I pulled off the main road and into the trailhead parking lot. There were a lot of people there. I was so excited, because I knew this was going to be my first hike of the trip. I got out of the car, pulled my hair into a ponytail (it was very hot), and grabbed my Nalgene bottle. I went to the trunk and looked at my hydration pack, which was filled with hiking essentials, and my boots, and then I looked at all the totally non-hiking dressed people headed out on the trail, and decided it was all overkill. I was sort of right. The Door Trail is very simple. The first part is handicap-accessible, for goodness sake. But in retrospect, and especially when I headed out for the Notch Trail, I should have geared up. If I didn’t want to fill my hydration pack with water, or if I didn’t want to carry too much, I could have at least put the boots, sunscreen, and hat on. This is on a hike in Bryce Canyon National Park, in Utah. As you can see, I’m more appropriately geared. Those are pants (and yes, I did see a rattlesnake on this trail). I’m wearing a hiking shirt, and a hat. I am wearing sunscreen (though you probably can’t tell). I’ve got my hydration pack filled with 2.5 liters of water, first aid kit, cell phone, compass, etc. etc. etc. Thanks for playing. Remember, we all make mistakes when we don’t know any better. My goal is to help you avoid them as you embark upon your own solo journeys. © Her Side of the Mountain, 2010. 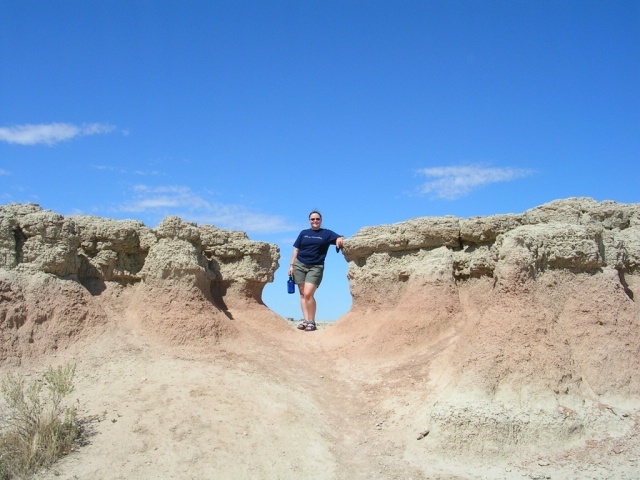 There I am, nearly six years ago (yikes), at the end of the Door Trail at Badlands National Park in South Dakota. There are a couple of very significant things about this photo. This was my very first solo hike ever. It was day five of my Road Trip. The first four days I was concentrated on getting west as fast as possible (with a two-night stop in Chicago to visit a friend), and on the fifth day, I finally arrived, early afternoon, at my first National Park. I was chomping at the bit to get out on the trail, since hiking was the focus of my trip. I was also scared about my first solo hike, but comforted by the fact that I had picked an easy intro hike, and the fact that the beginning of the Door Trail (which is less than a mile out-and-back, the first bit of which is handicap-accessible) was crowded with people in sundresses and little children. Yes, I looked at them and thought, if they are doing it, then I certainly can. But that’s all right. On Friday, we’ll talk about the things I did wrong on that hike, and on the one that happened right after, that make me cringe at my own naiveté (or, in some cases, overconfidence or laziness). Make your guesses in the comments! On Monday, in a moment lacking inspiration, I offered to answer some or your questions. In no particular order (except the order in which I felt like answering), here we go! Adelaide of Dressed in Dirt asked: Ok, here’s mine: when did you first start hiking solo and what motivated you to do so? My solo hiking was borne out of necessity, and a desire to not be a wimp. Oh, and a need to keep up my image as a cool, independent woman who backs down from no challenge. Back in 2004, I graduated from law school and found out that I had two and a half months between taking the bar exam (at the end of July) and starting my job (mid-October). While my first thoughts were to panic about availability of cash, my second thoughts focused on travel. Immediately, I seized upon the fantasy of driving around the United States, especially since I had really only ever seen the eastern seaboard, Denver, and Chicago. Going alone was a little scary, but I thought I was up for the challenge…and after all, who else could leave their jobs/families for 6 weeks and go with me? But what to do while driving around? Realizing I had to find some way of picking where I was headed, I thought about different themes for the trip, and immediately knew I wanted to visit National Parks. I wanted to hike. But…I had never been hiking alone. Was it safe, especially since I’d be in unfamiliar places all by myself, thousands of miles from anyone I knew? Was I physically capable? Did I have any idea what I even needed? And there it was. A challenge. I sort of thrive on challenge. Telling me something can’t be done — or that I can’t do something — is a sure way to make me find a way to do it. I decided that I could hike and camp alone if I set my mind to it. The best part was, if I hated it, I only had to turn around and drive home. So I did my research, mustered up the courage to ask a lot of questions of the helpful REI clerks (who were, really, all too happy to walk me through the stores and help me try on backpacks and show me different types of hunting knives, I might add), and gave it a try. The rest, as they say, is history. Or herstory? No, I didn’t just say that. Sara asked: We’re moving out west this summer (Albuquerque, to be exact). Neither Bryan nor I have ever spent any time in that part of the country, and we’re looking forward to exploring it. Other than the grand canyon (which neither of us has ever visited and will only be two hours away), any good suggestions for day/weekend camping/hiking trips? Any favorite places in New Mexico, Arizona, Colorado, or souther Utah? Southern Utah is my favorite hiking destination yet. Zion National Park and Bryce Canyon are spectacular, amazing, incredible, and totally different places only an hour and a half from each other. See my two posts about Zion, and also reader Andra’s blog about her recent trip that included both parks. On the Utah/Colorado border is Moab, Utah, home to Arches National Park, another one of my favorites. This is desert hiking at its finest. Between Moab and Bryce are Canyonlands and Capitol Reef. With smaller parks as well, southern Utah is a playground for campers and hikers. I’m not sure if it’s a weekend from Albuquerque (a day’s drive or so), but it’s worth a trip. In Arizona, there are a few suggestions I could make (aside from the Grand Canyon, which is a given). First, you might want to check out Canyon de Chelly National Monument, which is between you and the Grand Canyon. 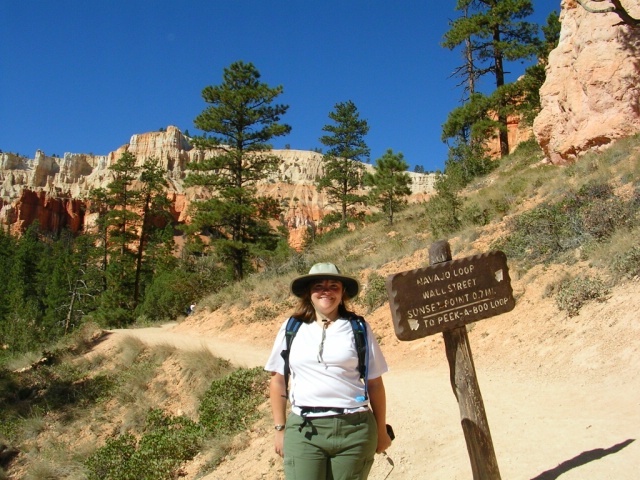 I’ve never been, but there are self-guided and guided hikes, and a campground. Second, this isn’t a hiking or camping destination, but you’ll definitely want to go see Meteor Crater, which is also between you and the Grand Canyon. It’s a very well-preserved…yes, meteor crater…and it’s really really really big. I promise it’s not as kitschy as the website makes it look. Third, try venturing into Oak Creek Canyon by Sedona, Arizona in the Cococino National Forest. Tons of hiking, fishing, camping, and watersports available all over the area. Finally, New Mexico itself. I haven’t spent any time camping or hiking in New Mexico. I meant to, but on my road trip New Mexico was where I blew out a tire on the highway and ended up spending the night in a teeny little town, eating at a Denny’s, and then getting a new tire when the tire shop opening in the morning. Check out the NPS page for New Mexico for ideas; there are quite a few National Monuments, including Petroglyph, near Albuquerque. Dad (yes, my dad) asked: Tell us about your youthful adventures at Alton Jones, Chewonki and backpacking in Ireland. And don’t forget Mark Trail. Well, that’s not a question, Dad. Those are suggestions. But they are much appreciated. I’ll share one anecdote for now, and file these ideas away for future posts. When I was maybe fourteen, my ninth grade class spent a week camping at Chewonki in Maine. I was not a camper back then. The woods scared me. Animals scared me. Dirt scared me. Bugs scared me (okay, bugs still scare me). One night, the girls in my group were misbehaving and hanging out in one of the boys’ tents. Eventually, everyone fell asleep. Except me. I realized I still had my contact lenses in, and had to take them out if we were going to spend the night. So after debating with myself awhile, I very carefully snuck out of the crowded tent, made my way in the pitch black forest to my own tent, located my lens case (in the dark…I couldn’t find a flashlight), removed my lenses (in the dark), and proceeded to try to make my way back to the boys’ tent (in the dark, now without my lenses, meaning I was basically blind). I was trying to walk quietly, to not wake anyone up, and slowly because I was mainly guessing where I was going. I put my left foot down onto something that felt weird and soft — and it moved! It ran. I am not kidding. I caught myself, choked back a scream, and ran myself — over a small sapling and smack into the platform with the boys’ tent. Trying not to panic, I climbed into the tent and settled myself back in. Of course, me banging into the platform had woken up everyone inside the tent, and we girls decided to go back to our tent to sleep, so we wouldn’t get caught in the morning. To this day, I don’t know what I stepped on. A raccoon? A skunk? I don’t know, I don’t care, and it scared me silly. Thanks for the questions, everyone!